In English, Nigella sativa and its seed are variously called black-caraway, black-cumin, fennel-flower, nigella, nutmeg-flower, Roman-coriander, and kalonji (from Hindi). Blackseed and black caraway may also refer to Bunium persicum. 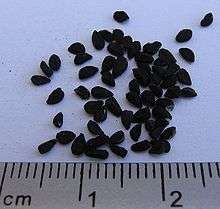 The seeds of Nigella sativa are used as a spice in Indian and Middle Eastern cuisines. The black seeds taste like a combination of onions, black pepper and oregano. They have a pungent bitter taste and smell. The dry-roasted nigella seeds flavor curries, vegetables and pulses. It can be used as a "pepper" in recipes with pod fruit, vegetables, salads and poultry. In some cultures, the black seeds are used to flavor bread products. It is also used as part of the spice mixture panch phoron (meaning a mixture of five spices) and by itself in many recipes in Bengali cuisine and most recognizably in naan bread. Nigella is also used in Armenian string cheese, a braided string cheese called majdouleh or majdouli in the Middle East. According to Zohary and Hopf, archaeological evidence about the earliest cultivation of N. sativa "is still scanty", but they report supposed N. sativa seeds have been found in several sites from ancient Egypt, including Tutankhamun's tomb. Although its exact role in Egyptian culture is unknown, it is known that items entombed with a pharaoh were carefully selected to assist him in the afterlife. The earliest written reference to N. sativa is thought to be in the book of Isaiah in the Old Testament, where the reaping of nigella and wheat is contrasted (Isaiah 28: 25, 27). Easton's Bible dictionary states the Hebrew word ketsah refers to N. sativa without doubt (although not all translations are in agreement). According to Zohary and Hopf, N. sativa was another traditional condiment of the Old World during classical times, and its black seeds were extensively used to flavor food. 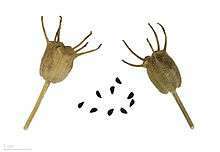 Seeds were found in a Hittite flask in Turkey from the second millennium BCE. Nigella sativa oil contains conjugated linoleic (18:2) acid, thymoquinone, nigellone (dithymoquinone), melanthin, nigilline, and trans-anethole. Mainly for its seed oil extract, thymoquinone, N. sativa is under research for its potential to affect human diseases, such as cancer or medical conditions such as dyspepsia, although studies to date remain insufficient to understand its potential for clinical efficacy. ↑ Hyam, R. & Pankhurst, R.J. (1995). Plants and their names : a concise dictionary. Oxford: Oxford University Press. ISBN 978-0-19-866189-4. p. 341. 1 2 3 Bharat B Aggarwal. Molecular Targets and Therapeutic Uses of Spices. Google Books. p. 259. ISBN 978-981-4468-95-4. Retrieved 4 January 2015. ↑ Bramen L (16 February 2011). "Nigella Seeds: What the Heck Do I Do with Those?". smithsonian.com. The Smithsonian Online. Retrieved 4 January 2015. 1 2 Zohary, Daniel; Hopf, Maria (2000). Domestication of plants in the Old World (3 ed.). Oxford University Press. p. 206. ISBN 0-19-850356-3. ↑ Mohammad Hossein Boskabady; Batool Shirmohammadi (2002). "Effect of Nigella Sativa on Isolated Guinea Pig Trachea" (PDF). Arch. Iran. Med. 5 (2): 103–107. ↑ Ali BH, Blunden G (2003). 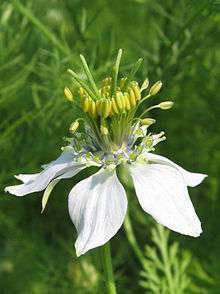 "Pharmacological and toxicological properties of Nigella sativa". Phytother Res. 17 (4): 299–305. doi:10.1002/ptr.1309. PMID 12722128. ↑ "Efficacy and safety of honey based formulation of Nigella sativa seed oil in functional dyspepsia: A double blind randomized controlled clinical trial.". J Ethnopharmacol. doi:10.1016/j.jep.2015.09.022. PMID 26386381.